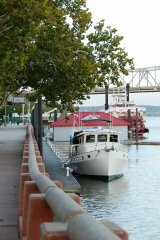 Our river journey will take us from the Great Lakes to our home port of Chattanooga, TN. 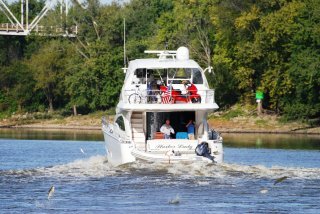 We will be traveling down the Illinois, Mississippi, Ohio, and Tennessee River systems for the next 1100 miles. We did this trip two years ago in a little 18’ boat (see our 2010 log “The Great Little Boat Adventure“). It is ironic that on our previous trip the Mississippi was at record flood levels of 25’ above normal. Now the river is at record low levels due to the severe drought. These shallow waters will make it very difficult for us with our 5’ draft. 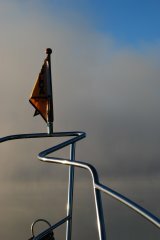 Most anchorages and marinas are now too shallow for us to enter. These skinny waters are a real concern for us, so much so that we were very close to postponing our trip until next year. The Mississippi River will be our major challenge. Even in years with normal water there are very few anchorages on this river. We may be forced to running this section at night, not a good situation. 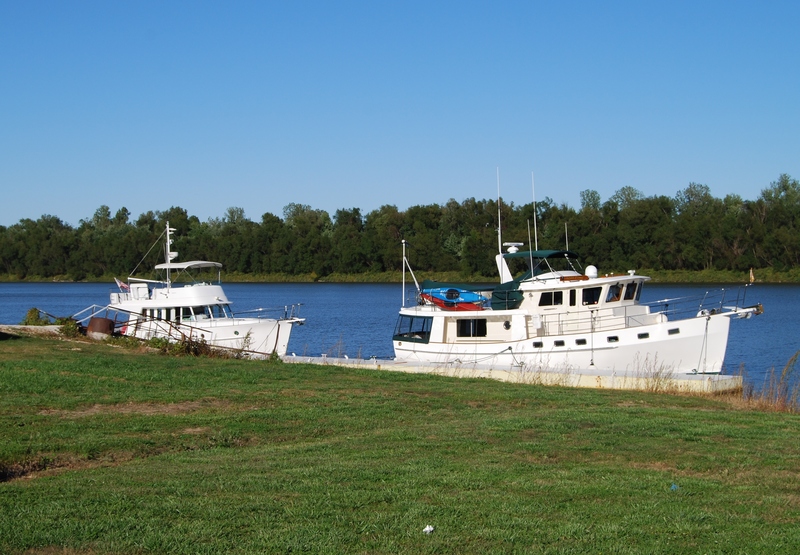 After talking with many other boaters on the river system now, we have made the decision to go. Lets hope this is the right decision. Time will tell. Rivers here we come! 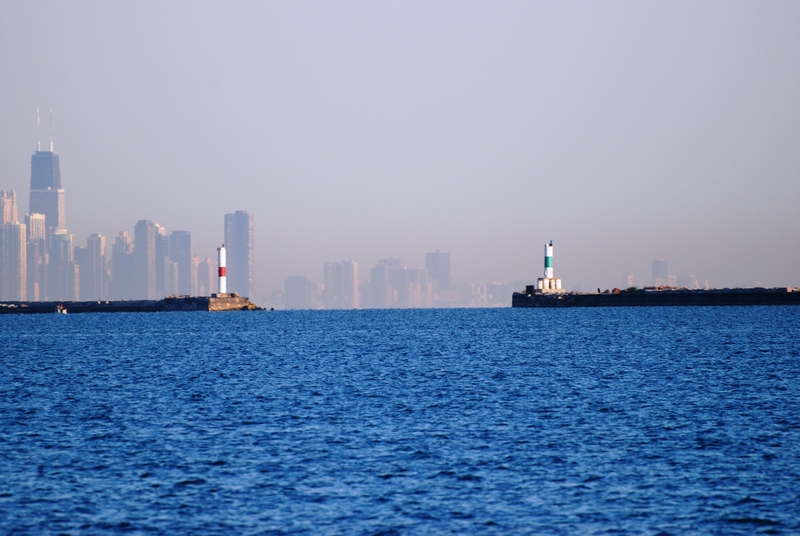 We say good bye to Lake Michigan and also Jim’s Joy as they are going to spend a few days here exploring Chicago. 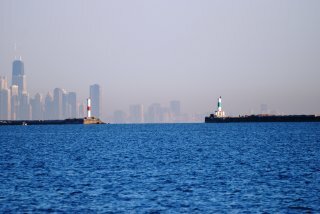 Just outside the Hammond Marina we enter the Calumet Breakwater and are soon in the Calumet River. This area is very industrialized. 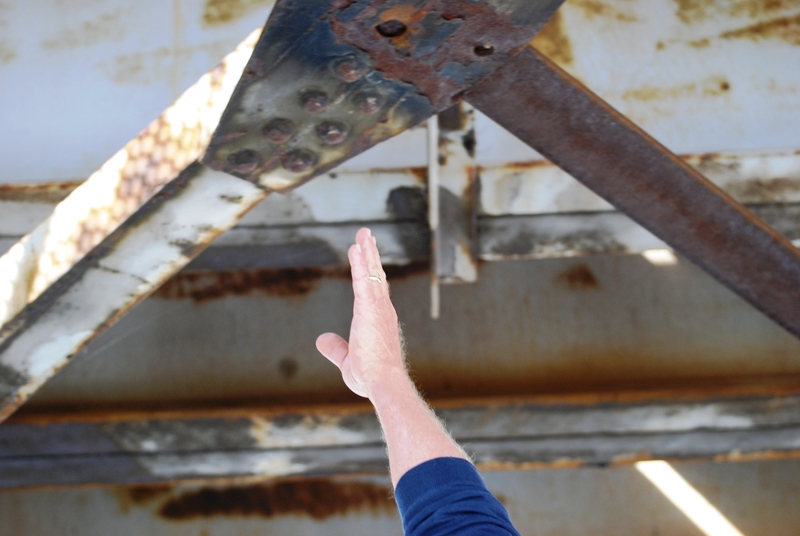 We lower all of our antennas and wind generator to get under the many bridges. With the water levels down a good foot we are able to sneak under all but one of the bridges without an opening. We are soon to our first lock, The Thomas O’Brien, where we have no wait and only a 2 ft. drop. The Calumet Sag Channel takes us 30 miles to the junction of the Chicago Sanitary and Ship Canal. This canal connects ship traffic with the inland rivers and also takes all the sanitary waste from Chicago south so that it does not pollute Lake Michigan. Boats coming from the downtown Chicago route join us at this intersection. 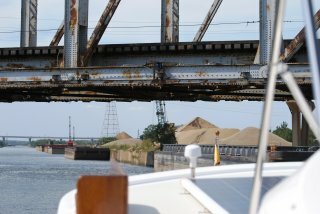 We could not take the Chicago route due to our height of 19 ft. and low fixed bridges of 17’. The next 12 miles of are known as “The Twelve Miles of Hell” due to the narrow canal and congested barge traffic in this area. Our lowest bridge of the entire loop is also on this section. It is fixed with a published clearance of 19 ft. Due to the low water levels we are able to clear this without taking down our arch and still have almost a foot to spare. 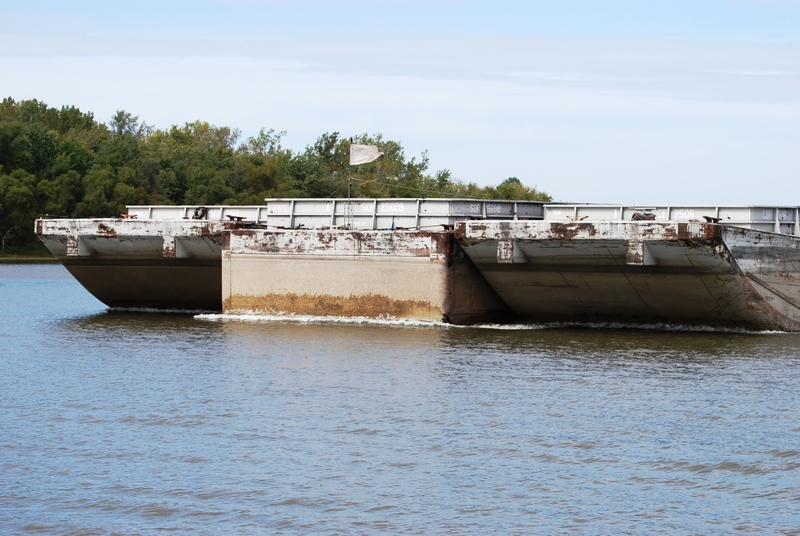 Next up was our crossing of the electronic fish barrier that has been installed underwater to prevent the Asian Carp from entering the Great Lakes. 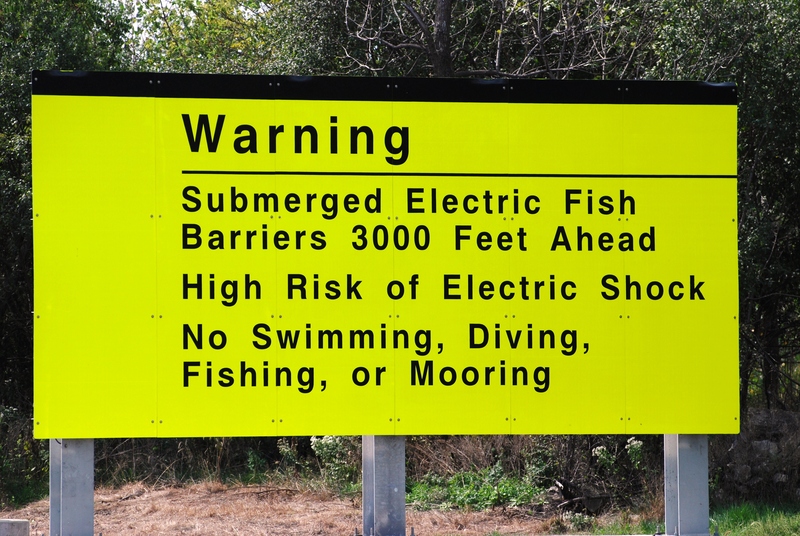 Other than a lot of warning signs the crossing was uneventful. Being a Sunday, we only pass one barge through this narrow section of canal. Our second lock of the day, Lockport Lock, has the largest drop of any Illinois locks at 39 feet. We have a 30 minute wait here while the chamber fills with water. 50 million gallons of water flush through this lock with each lockage. This lock thru goes well and we are soon on our way to Joliet where we stop for the night. The town provides free dockage and power along the rough concrete town wall. We are the only boat here. Before leaving the docks at Joliet this morning, we call the Brandon Road lockmaster to see what the wait status at this lock will be. We are only 2 miles from the lock and don’t want to untie if there is a long wait. He tells us to “come on” as there is one barge in the lock now and then he will get us through. After a 20 minute wait, we have an easy 34 foot lockdown. Fifteen miles downstream we approach our second lock of the day, Dresden Island Lock. There is a barge going in the lock when we arrive. We radio the lockmaster to let him know we are here and he tells us to stand-by but it will be about a two hour wait. The barge ahead of us has to split his load into two lockages. Well… the 2 hour wait turns into 3 ½ hours. Just as we are about to enter the lock another barge appears behind us. Luckily we are allowed to lock thru before him. The lock master could have made us wait, as commercial vessels have priority over pleasure craft. Once in the lock we learned that he locked us thru instead of the barge because there is another barge downstream waiting to lock upstream. 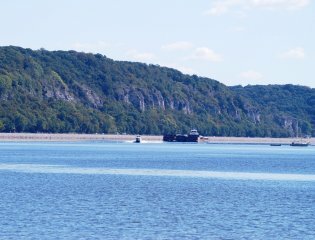 Had he locked the barge thru there would not have been room for the two barges to pass each other on the downstream side. Lucky for us! This lock requires us to do a port side tie. Our boat does not maneuver well on that side and we also don’t have a walk way like on the starboard, so docking is always more difficult. We manage to secure the floating bollard without much trouble and have an easy lock down. From there we have a nice trip along the Illinois River to our third and final lock of the day at Marseilles. Our wait here is only about 20 minutes while the chamber is filled. This is good because we are now racing some severe thunder storms hoping to get docked before they arrive. Our stop for the evening is only a few miles downstream of the lock at Heritage Harbor Marina. We had called ahead to check on depths at the entrance to the marina as we had heard from another boater that the entrance was shoaling in. We were assured that there should be no problem for our 5’ draft but to just take it slow. Slow we went as our depth alarm started screaming at us. We ended up bumping the bottom twice and saw one reading of 4’ 7”. Ouch…but once in the harbor our depths increase and we have 6-7 ft. at our slip. Today was a long day. We only traveled 45 miles but it took us over 9 hours and three locks. We are just glad to be here. Well we can’t go anywhere for the next two days. The Starved Rock Lock, just 10 miles downstream, is closed for maintenance work. The marina here is very nice so it is not too bad a place to be stuck. The marina has a courtesy car which we used to do some grocery shopping. We did find a nice bike path along the I & M Canal. 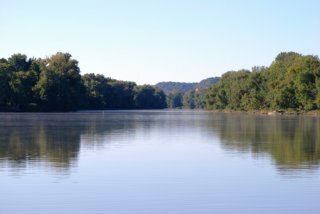 This bike trail goes for 95 miles along the Illinois River. We enjoyed a 20 mile bike ride south to Utica. Two other south bound boaters came in to the marina also. One 60′ boat touched bottom at the entrance. He hailed the marina on the VHF and they came out to help him in. When we touch bottom it is just with our keel as our prop is protected up above the keel. Most of the power boats have exposed props and rudders which makes hitting something much more serious. This boater will have the marina tow him out to the channel when he leaves. We did take the dinghy out today to sound the depths. We plotted the deepest area and hopefully we can get out without hitting anything. There is one 4’7 spot that will be hard to avoid. We are crossing our fingers that the water doesn’t go down any in the next day. Not sure what we would do if that happened. With barely enough depth now, we are eager to get out as soon as possible. We just have to wait on the lock to open. Hopefully their repair will go as scheduled and we can get underway tomorrow. 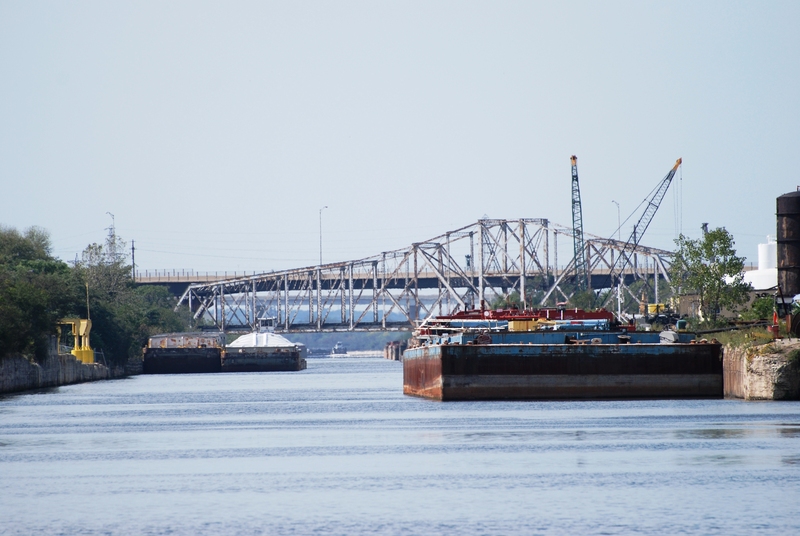 We also learned today that Lock #27 on the Mississippi is now closed due to a collapsed wall. We still have over a week before reaching that lock so hopefully it will be up and running by then. A call to the lock downstream first thing this morning confirms that the lock is back in operation and the lockmaster tells us to come on down. We make a slow exit out of the shallow harbor. The water levels seem to have risen 3/10 ft. and we never touch bottom. Harbor Lady, the big power boat who hit coming in yesterday, is up and calls us on the VHF asking what we see for depths. Like us, he is also worried about getting out. Once out in the channel the river is very pretty this morning with a light fog hanging low over the water. We are back in the one and two whistle language of the tows. We encounter our first up bound barge just after leaving. We always radio the barges and ask which side they would like us to pass. 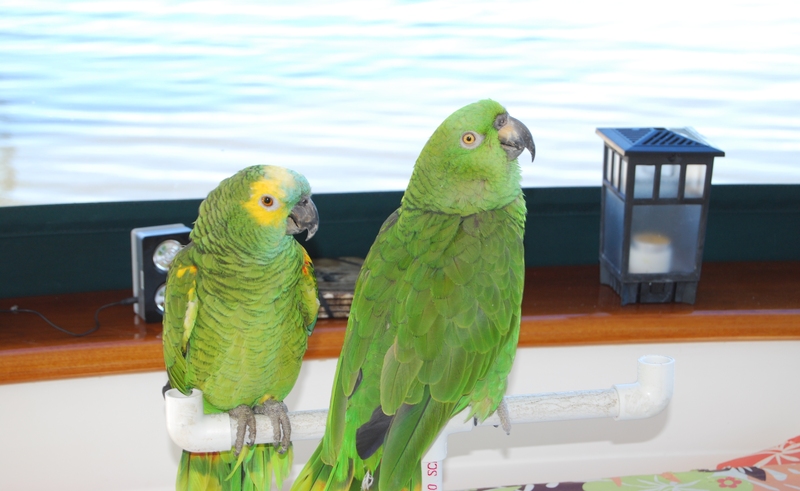 One whistle and we move to our starboard side….two whistles and we move to our port side. Our first and only lock for today, Starved Rock Lock, is 10 miles downstream. Here we have an hour wait while a barged is locked upstream. We lock thru with Harbor Lady and two other sailboats. Just after leaving the lock, we let Harbor Lady pass us as she can travel much faster. 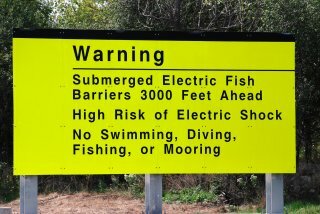 Boy does this cause a lot of commotion in the water. The jumping Asian Carp make their initial appearance and are jumping like crazy. There seems to be hundreds of these silver two foot torpedoes. The river is also alive with avian wildlife. 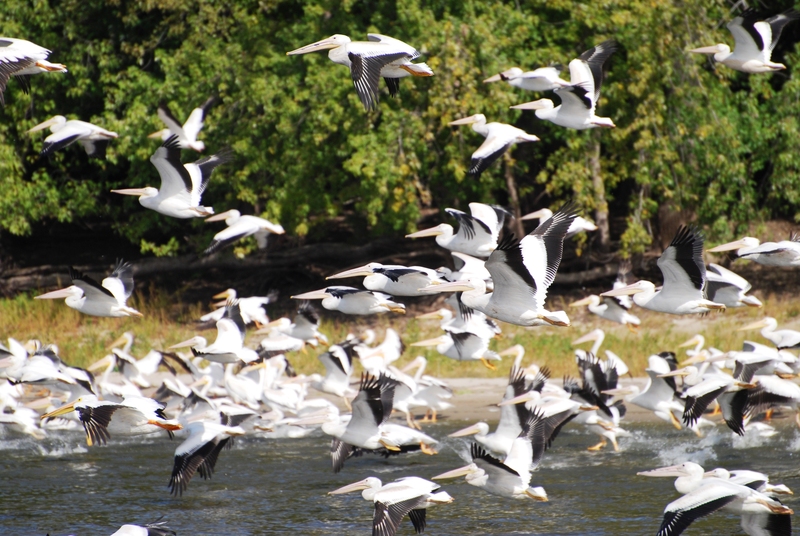 We saw hundreds of white pelicans as they seemed to be feeding on these Asian Carp. 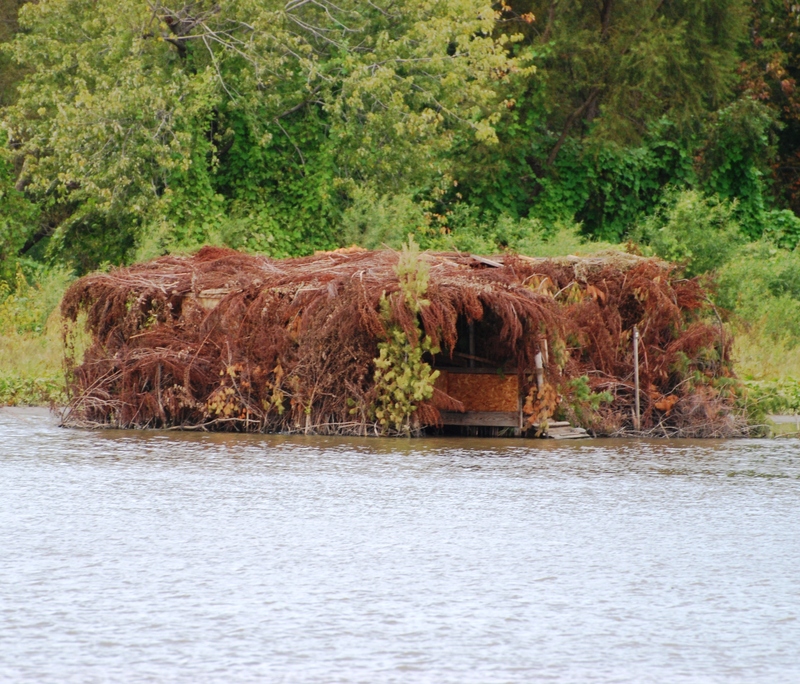 The tree lined banks are home to several pairs of bald eagles. We find traveling down this section of the Illinois River to be very enjoyable. Our Kadey-Krogen made us proud today while passing one of the barges. After hailing the M/V Gene Herde, who is pushing 12 barges, on the VHF asking if we could pass, he tells us “I’ll see you on the two”. Just as we were midstream in the overtaking, he hailed us again on the VHF. Our hearts jumped as we thought maybe we were doing something wrong. Did we get our port and starboard whistles confused? Well it turned out he was calling to ask about our boat. He thought she was very good looking! We consider that quite a compliment from these experienced and gruff tug captains. Krogen does put a lot of effort in their design and style of boats and it shows. Our good fortunes continued as we reached Peoria, IL. The docks along the downtown waterfront are really our only option for stopping tonight. All of the nearby marinas are too shallow for us. 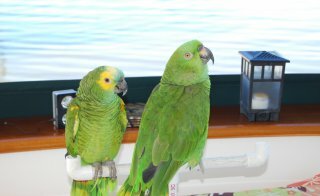 Not sure if these docks are large enough to accommodate us, we eagerly scan the shoreline with the binoculars as we approach. It turns out there are only two places for us to fit. One is taken but luckily for us there is one spot still open. 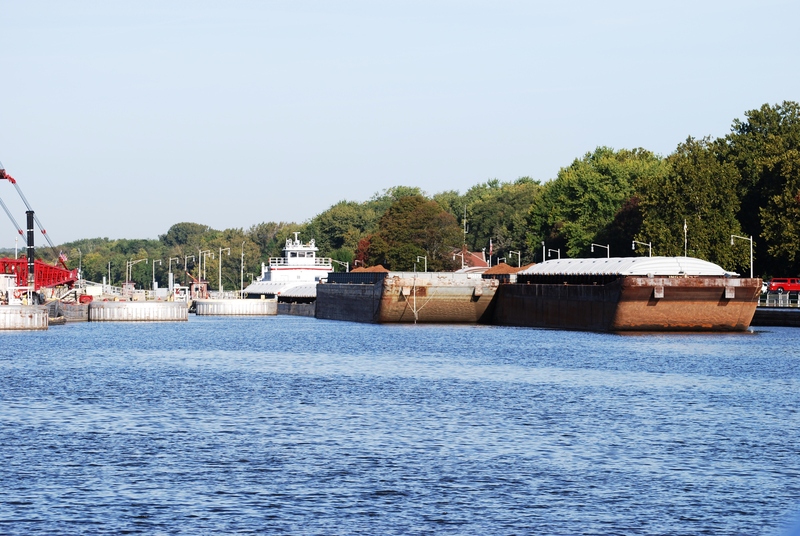 There are signs posted along the docks stating “No Overnight dockage- Day use Only”. In talking with other boaters ahead of us, they all stopped here with no problem. We just hope our luck holds out and no one kicks us off during the night. Our overnight stay at the Peoria docks went well…we didn’t get kicked off the docks during the night which was a good thing. We are however underway at first light this morning before things get busy on the waterfront. 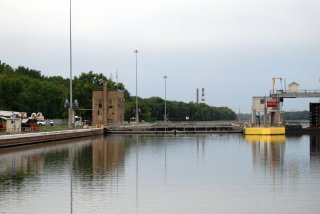 The Peoria Lock is just five miles downstream. We are again lucky with only a 15 minute wait while the chamber is filled. We have an easy 10 ft. drop and are on our way. Outside the lock we find this section of the Illinois to be two foot lower than normal as we get closer to the Mississippi. We have a very narrow channel with little room for error. Even in the channel our depths are only 11 ft. Just ahead we catch up with the barge “Gene Herde” again. We can’t seem to get away from them. They passed us last night while we were asleep in Peoria but they only travel about 3.5 mph so we keep leapfrogging each other. They tell us it is O.K. to come around but to be careful and stay as close as possible to them. It is shallow just off the green cans, there is a snag in the water, and one of the buoys is out of place. Seeing the situation ahead, we quickly back off and let them know we will wait for a better place to pass. 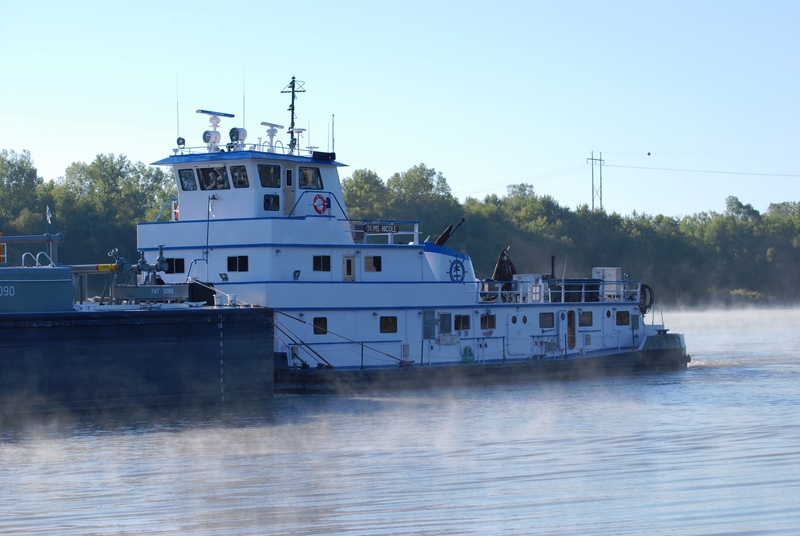 Once on the straightaway, we make our pass with only 10 feet between us and the 12 barges and shallow depths of 9 ft. It is a nail biter as we work our way around them. During the day we have several more tows that we navigate past. Why do they always seem to occur when we are going around a narrow shallow bend in the river and never when we are on the long wide straight stretches of river? Late afternoon brings us to the Lodgston Barge Service which is our home for the night. We tie along side their crane barge. 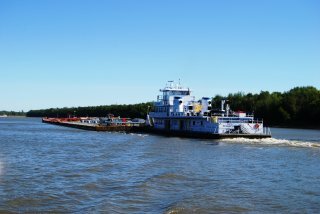 This family operates six tugs that move grain and coal barges around the Beardstown area. 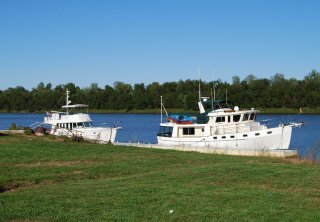 We are fortunate that they allow pleasure craft to tie here overnight as there are no marinas or other dock facilities for many miles. At $1.00 ft. with no water or electricity it is still a good deal. The Hilton it is not but it does provide a safe secure place to get off the river. 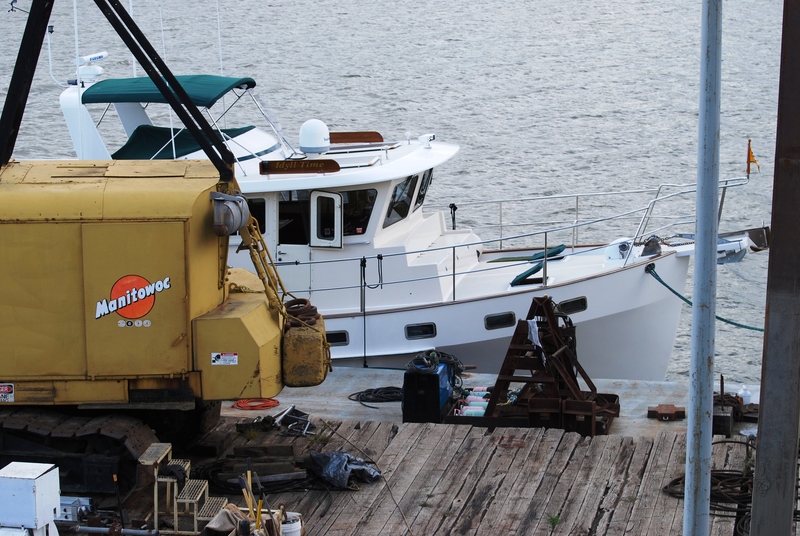 We are joined this evening by M/V Miller Time, a 60 ft. Viking. We first met Phil and Sandy this summer while in Harbor Springs, MI. They had told us then of their plans to start the loop this fall. Traveling with them is another boater couple from Michigan whom we had also met while on Mackinac Island. What a small world it is. We have a great dinner with them at a local diner in Beardstown. We are back underway at first light. Our only lock for today is 8 miles downstream at LaGrange. Miller Time joins us as we enter the lock. The 30k gusting winds make it difficult tying to the lock wall. After a 7 ft. drop, we say good-bye to Miller Time as they can travel a lot faster than us. Our day is busy as we encounter four north bound tows in just a five mile stretch. Part of our navigation system onboard is AIS which stands for Automated Information Signal. Each of the tows broadcast their name, position, and speed onto our navigational screen. This is a valuable tool giving us advanced notice of meeting the barges. With the narrow twisty river, it is nice not to have a surprise encounter with one of these big guys. We can set up our passing with them several miles in advance. At mile 61 we reach the farthest west of any point on the Great Loop route and also the farthest west we have ever traveled in IT. Passing under the Norfolk and Western RR Bridge we are at W 90.38.766 longitude. From this point onward, we will be traveling southeasterly on the Great Loop Route. After a busy morning on the river, this afternoon we find a completely different waterway. For the next 35 miles we never see another boat. We are in rural America with nothing but farmland on both sides of the river banks. Our stop this evening is in the small town of Hardin, IL at Mel’s Illinois River Dock Restaurant. For $25 a night the restaurant allows boaters to tie along their 200 ft. floating dock. 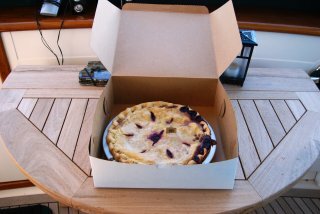 Jeff returns from checking in at the restaurant with a whole Bumble Berry pie (blueberries, blackberries, and boysenberries). Boy does it look good. The restaurant also has a very good reputation among boaters for their home cooked meals. Another boater from Arkansas joins us this evening and we enjoy a great dinner with them at the restaurant. Jeff’s 2” thick pork chop and my beef brisket were some of the best meals we have had on the trip so far. Mel’s is a great stop! 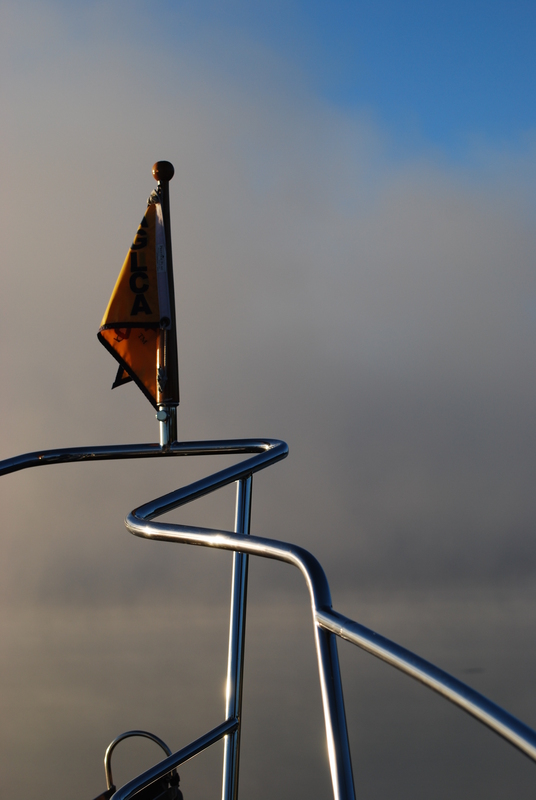 It is pea soup out on the river this morning with dense thick fog. We aren’t going anywhere for a while. Luckily today is a short travel day with no locks so there is no rush. 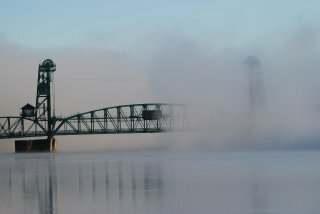 The fog lifts about 10:00 AM and we are underway. This section of the river is very enjoyable as we meander around the wide and deep bends. It reminds us a lot of the Tennessee River. 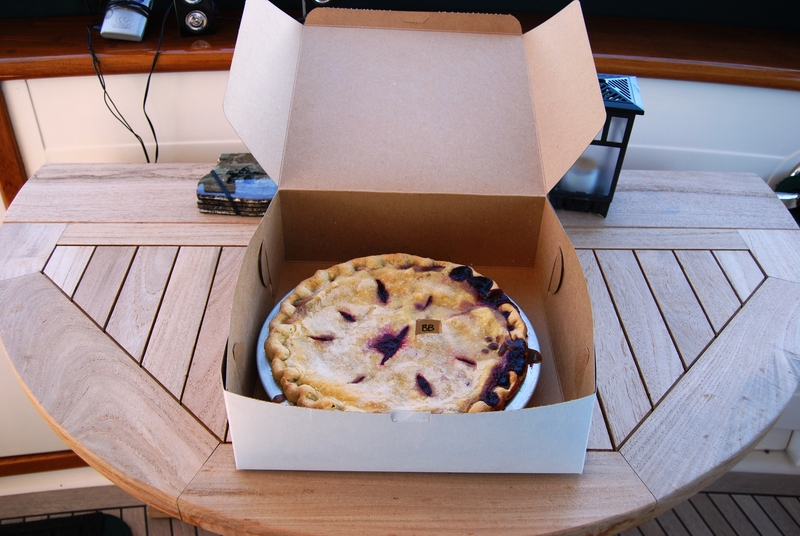 For breakfast this morning we enjoy our first taste of the Bumble berry Pie which we purchased last night at Mel’s. It is for sure one of the best pies ever!! 21 miles down river, we reach the town of Grafton, IL at mile 0 on the Illinois River. 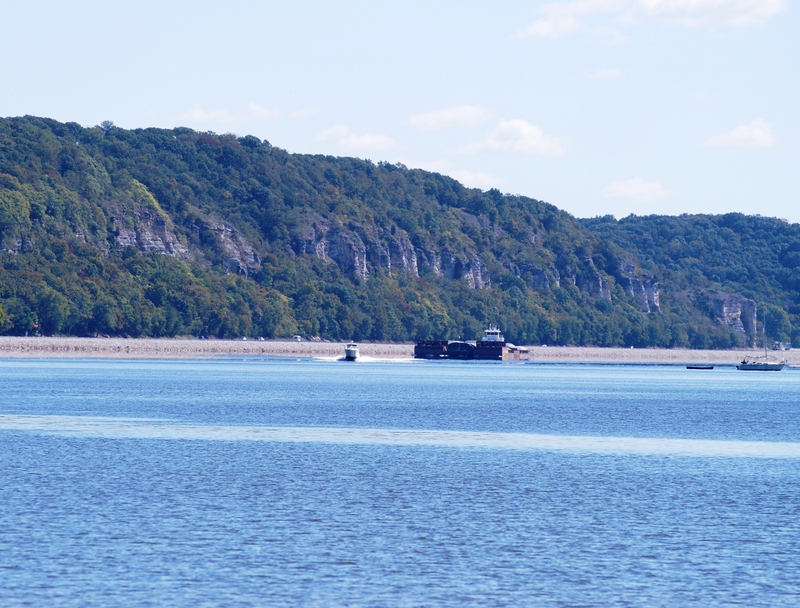 This is the confluence of the Upper Mississippi and the Illinois River. We officially enter the Upper Mississippi at mile marker 218. 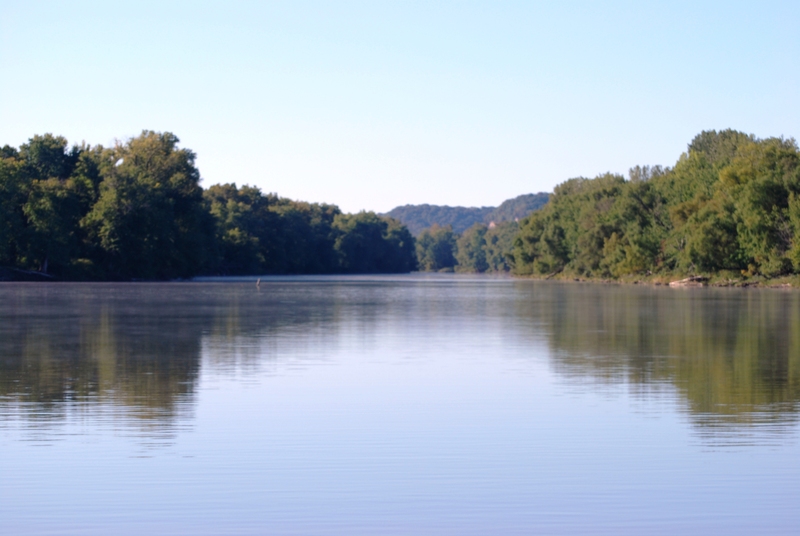 For the next 218 miles we will be traveling the “Big Muddy” to Mile 0 where we will join the Ohio River. The river landscape has changed with high cliffs on our port side and low flooding farmland on our starboard. Unlike what we will encounter in just a few days, this section of the Mississippi is wide and deep with very little current. Once through the two locks just a few miles from here the Mississippi will be untamed with no locks to regulate its flow. Our home for the next few days is Alton, IL. 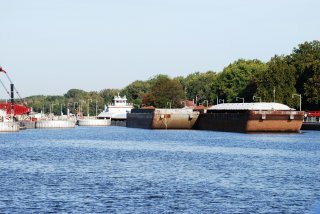 We are just 20 miles north of Saint Louis and a stones throw from our first lock on the Mississippi. Idyll Time will take a break here for a few days before taking on the challenging Mississippi River which will undoubtedly be the most difficult part of our river trip. These next 218 miles of the Mississippi scare the cajebers out of me! This entry was posted on September 27, 2012 at 12:17 am. You can follow any responses to this entry through the RSS 2.0 feed. You can leave a response, or trackback from your own site. 3 Responses to "The Great Rivers Part 1: Great Lakes to The Mississippi"
It was really nice talking to you in Hardin, IL. I see you took a picture of your pie. Hope you enjoyed your meal at Mels. Enjoy the rest of your journey and be safe. We are inspired by what you are doing. Great article thank you. I found your log because I was searching for information on getting a boat from Chattanooga to Chicago and onto Lake Huron [Georgian Bay]. 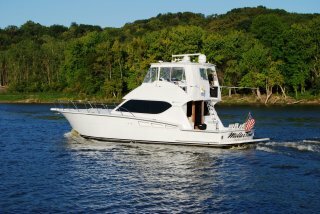 You see we’re in the market for a Grand Banks 42 and a wood model is currently for sale in Chattanooga. 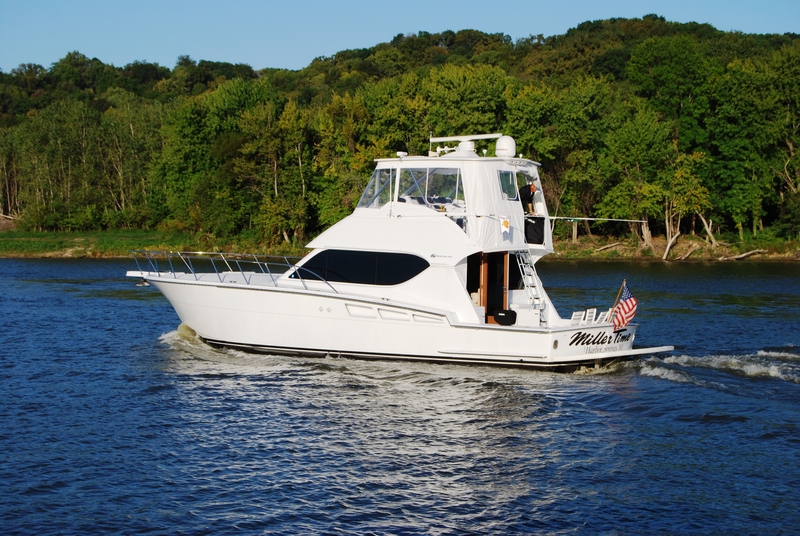 I have a 26′ cabin cruiser and have always wanted to take the Mississippi uptown the Great Lakes. Originally from toledo, oh I grew up on Erie in my dads 25 ‘ fussy cabin and now have my own boat on lake Lanier in ga. My marinas manager and I have been talking about the ” Tom and huck trip ” for a while. Looking like I’ll finally have the time and a friend to do it with. Very interested in the rest of your trip. Please respond and inform. Enjoyed your journey. Thanks.